Five people are dead after a tour bus heading from Mexico to Washington state veered off a highway in California and hit a highway pole. FRESNO, California (WPVI) -- Leonardo Sanchez was sleeping peacefully on a bus carrying him to Oregon to pick blueberries when he was suddenly thrown face first into the back of the seat in front of him, awakening him to a horrific scene of chaos and death. The bus carrying Sanchez and about 30 others on a pre-dawn journey through California's agricultural rich San Joaquin Valley had somehow plowed head-on into a highway pole that nearly sliced it in half. Five people died and at least 18 were hurt, including six listed in either serious or critical condition. At least five people are confirmed dead after a tour bus crashed on a highway in California. Merced County Sheriff Vern Warnke said rescuers pulled "bags of body parts" from the bus along with survivors. He said some victims were thrown from the vehicle and landed in a ditch. The bus, operated by Autobuses Coordinados USA, was heading to Washington state. It was approaching Livingston, a farming and industrial town of about 13,000, where it had been scheduled to change drivers. Apparently running late for its 1:30 a.m. driver switch, the bus veered off the highway shortly before 3:30 a.m. It was no more than a couple miles from its scheduled stop when the crash occurred. 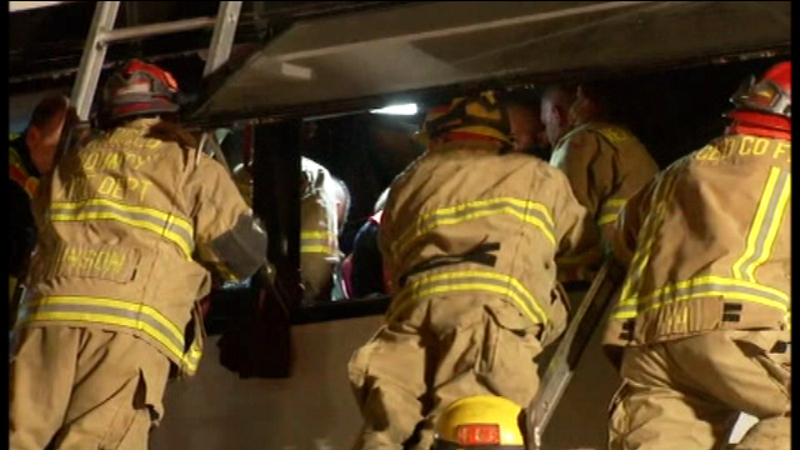 When emergency workers arrived they climbed through the shattered windows to pull the trapped passengers out. Doctors Medical Center in Modesto received five patients, including two men and one woman in critical condition and two women in serious condition, said hospital spokeswoman Carin Sarkis. She said her hospital also was expecting the arrival of a crash victim whose condition was not immediately available. Emanuel Medical Center in Turlock said earlier it was transferring a man in serious condition to the Modesto facility. In all, at least 18 people were injured, according to officials with four area hospitals. Three taken to Emanuel Medical Center were treated and released, said hospital spokeswoman Pennie Rorex. Four others were admitted to Memorial Medical Center in Modesto in fair condition, said spokesman Craig Baize. Mercy Medical Center in Merced received five patients, said spokeswoman Lindsey Wine, adding that four were released and one was transferred elsewhere in stable condition. The bus was traveling north up State Route 99, which cuts through the center of California farm country and was about 15 miles from Merced when it crashed. The still-intact sign stuck out from the roof of the crumpled bus hours after the crash as crews prepared to move the vehicle. Wreckage and debris including seat cushions, drink containers, pillows and a blanket were scattered in lanes and on the highway's shoulder. The CHP's Onsurez identified the bus driver as Mario David Vasquez of the Los Angeles area, the Merced Sun-Star reported. The 57-year-old was among those with major injuries and was airlifted to a hospital, the newspaper said. State Route 99 runs through farm fields and almond orchards in the San Joaquin Valley northwest of Fresno. Its northbound lanes were closed during the investigation, backing up traffic for miles. She said the pole in Tuesday's crash had the required barrier - in this case, a guardrail - on the side facing lanes. Weber reported from Los Angeles. Associated Press writers Alex Veiga, John Rogers and John Antczak in Los Angeles contributed to this report.